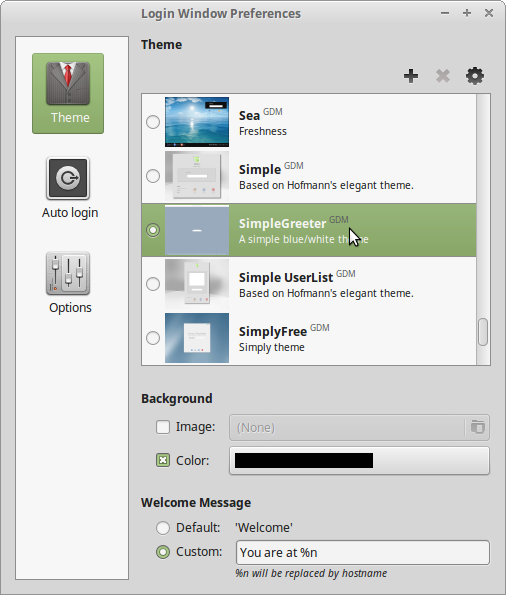 Linux Mint uses an HTM-based login screen that displays an assortment of lush images. That would be fine, except that on the Lenovo Q150, the rendering engine (or whatever you call it) drives one core at full throttle whenever the login screen is up. That turns out to be all the time when I’m signed in through ssh and, for that box, the HTML engine is just a sucking chest wound. Then pick any theme using GDM rather than HTML; they’re marked to the right of the theme name. Set it to auto-select the previous user (in the Options tab) and you’re good to go. Burns zero CPU and works for me, anyhow.